I was born and raised in Asheville North Carolina. I officially live in the little town of Candler but Asheville is just a couple steps away and it's the City of my area. I love it here! The mountains are beautiful and I really enjoy all the country land that's not filled up with businesses. Downtown Asheville is full of neat shops and diners that you can always find something to do! Not to mention all the art that is scattered throughout Downtown! Ohhh and you can't forget about the Biltmore House! (I've lived here all my life and never visited the Biltmore House but I plan on going atleast once while I'm finished on this earth!) 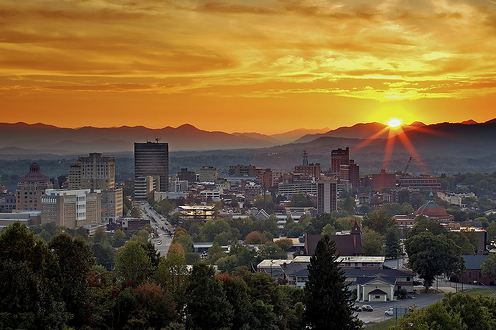 Asheville, NC is a wonderful place to visit and an even better place to live! The neighborhoods are great and as well as the people. If your planning on visiting on moving to or near Asheville, Check out the info below!! ExploreAsheville.com has a FREE Asheville Travel Guide available on their site! If your interested in relocating to the Asheville area, Request a Relocation Packet, which includes the Asheville Travel Guide. Sign up for the Asheville Traveler today! Interested in the Biltmore House? Have you ever visited The Biltmore House in Asheville, NC?